Well just look at these two. Aren’t they just the cutest? I’ve never seen a couple look so happy, relaxed and in love. This photo makes me want to cry with joy. Well done to Nick Parker at Parker Shots for capturing them so perfectly. It was clear from our first meeting, that these two knew exactly what look they wanted to create for their wedding at the glorious Chafford Park. Sarah wanted bright, zesty lemon flowers with fresh lime foliages. I selected David Austin roses, peonies, veronica, solidago, olive and ferns with which I created floral designs that were natural, loose and had a slightly wild look to them. It perfectly suited the rustic farm setting. 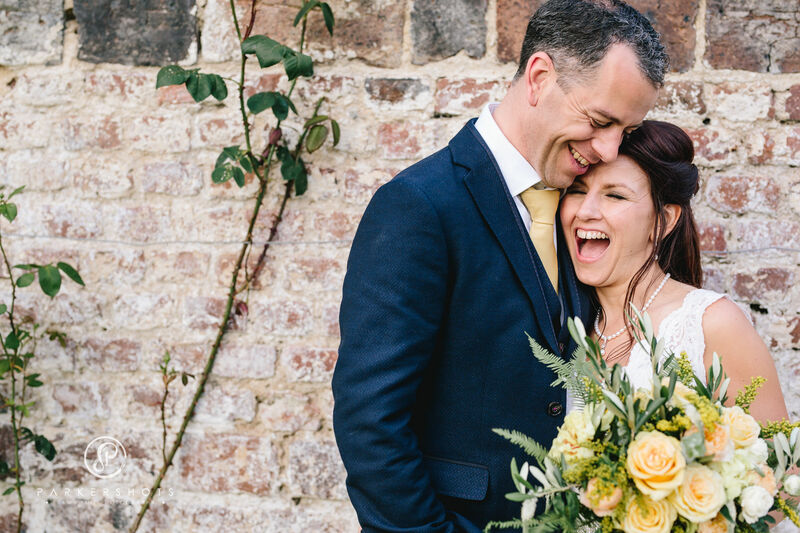 For the ceremony, Sarah and David wanted a relaxed look in The Granary Barn and chose a birch arch decorated with floral tie backs and white drapes. I love how pure and simple this looks against the wood panelling. And the yellow flowers really pop! For the wedding breakfast, guests were then taken next door into The Hop Barn. The size and scale of this space is not to be underestimated. It is stunning but huge so small table arrangements would have got lost. Sarah knew this and had already asked for tall centrepieces so that colour would be drawn up to the ceiling. These fabulous arrangements were over 150cm tall so they certainly added drama to the room, which was amplified by the stunning drapes installed by Not Your Average I Do.